Mariella’s family is going through hard times with her father’s death and her mother’s intense grief. They aren’t the only ones, though, it is the 1930s and jobs are hard to come by. Even the fishermen of her family’s acquaintance in Key West are having a hard time selling their wares as nobody is eating in restaurants anymore. Mariella is feeding her family one odd job at a time when she meets Ernest Hemingway. Hemingway knew and liked Mariella’s father, and he understands the pain of losing a father, so he decides to offer Mariella a job as a maid in his house. It doesn’t help that something about Mariella appeals to him, as well, and the attraction is mutual. At the same time, however, Mariella meets handsome WWI veteran Gavin Murray, one of the men employed building the Overseas Highway. Both men intrigue Mariella and both represent very different things to her life. What, exactly, does she want for her future? Mariella is a strong and compelling character. Although she must choose between attraction to two different men, Hemingway’s Girl is not really a love triangle. Mariella knows right from wrong, however she might be intrigued by her married employer. 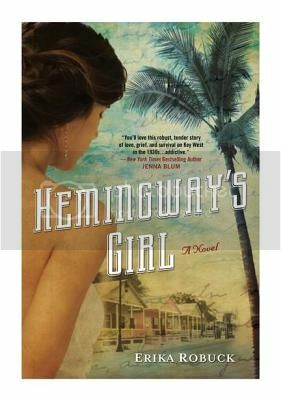 In Hemingway’s Girl, Robuck not only gives readers a peek into Hemingway’s personality and psyche, but also brings to life the realities of Depression-era Florida. The story of the WWI veterans hired to build the Overseas Highway and the poor treatment given them by their superiors is one many readers may not be aware of and is a very important piece of American history. Hemingway’s Girl is well-written and complex with a great story. Highly reocmmended.